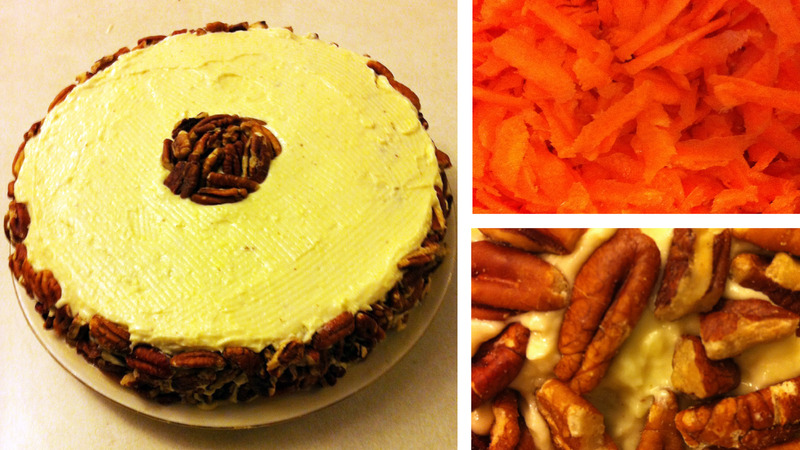 I was on a bit of a baking frenzy yesterday and also made a gluten free carrot cake, with cream cheese frosting, from the 50 Wholesome Gluten-Free Dessert Recipes book. So all I have to say is OMG! It tastes so good, has so much flavour and the cream cheese frosting is to die for! Not only does this cake taste amazing, it looks stunning, if I do say so myself! I sent pictures of the cake to all of my friends and now everyone thinks I am a culinary goddess! Umm… which I totally was way before I ever made this cake! This cake tastes delicious for something that is gluten free and pretty much all organic. The only two ingredients that were not organic were the baking soda and baking powder. The cake is very easy to make; you literally just mix all of the ingredients together and bake it! It does contain a lot of ingredients which prevented me from making it before but, let me tell you when you sink your teeth into this masterpiece you will not be disappointed! And on top of it, it’s full of wholesome and good quality ingredients, and there is nothing to feel guilty about after eating it! Preheat oven to 350°F. Grease a 9” spring foam pan with butter. Whisk together the flours, baking soda, baking powder and cinnamon. Add the brown sugar, applesauce, carrots, eggs, coconut oil, coconut, 1 cup chopped pecans, and pineapple. Mix until well combined. Pour batter into the pan and bake for 30-35 minutes or until a toothpick inserted into the centre comes out clean. Let cool completely. Meanwhile make the frosting by beating together butter and cream cheese in a bowl with an electric mixer. With the mixer on low speed, add the powdered sugar and mix until smooth. Beat in vanilla. Frost the cake and add pecans around the edges and in the center. TIP – Ensure the cake is completely cooled before you start frosting. If you do not wait, you will find the frosting will start to melt and slide off the sides. I also placed my frosting in the refrigerator for a little while before frosting as I find it easier to work with. I hope you try this recipe. This is by far my favourite recipe that I have ever made. It’s delicious, healthy and looks good! Let me know if you make it and what you think! TechTalk X is a series of interviews with the Tech and Creative Startups that are building growth in Ontario. Sassy. Sage. Sometimes Sarcastic. Never Dull.